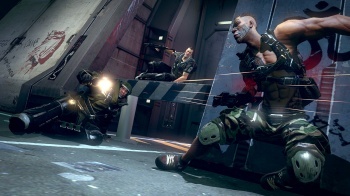 Bethesda Softworks' hyperactive shooter Brink may have launched to disappointing reviews, but the developer is determined to support its playerbase. Key to many critical arguments is the game's poor online performance. Even under ideal conditions, Brink's multiplayer gameplay can turn into a frustrating slideshow. Fortunately for players, Bethesda has heard their deafening outcry and is "working on updates ... to address the lag issue." We have made a configuration change for 360 users (which will be available to the PS3, once PSN is up) that alters the number of human players when matchmaking for "Campaign" and most 'Freeplay' modes to eight total human players. This new configuration will allow those connecting to and hosting matches (particularly those with lower upstream bandwidth) to more reliably find and connect to quality hosts via the match-making process - resulting in less lag and more fun. This change is being rolled out today and will be available worldwide. For players who haven't been experienced lag, we'll still support 8v8 on all maps via a new 'Big Teams' configuration in Freeplay, and through custom settings in Private matches. There is no download required for this update and it will be available automatically the next time you log in to play Brink and launch either campaign or standard Freeplay matches. This should allow players new to the Ark as well as veterans to find quality matches suitable to their preferred play style. We are also releasing an incremental update for PC players via Steam that addresses AI, GPU, and server issues. No doubt this comes as good news to those players still expecting big things from Bethesda's latest title, but I haven't even mentioned the best part yet. As something of a "thank you" note to the Brink playerbase, Bethesda has revealed plans to release the game's first downloadable content pack absolutely free. Official details have yet to be released, but Bethesda promises "additional maps and new content" will be included when the add-on is released this June.